On March 28th, 2012, No Nukes Action and Occupy San Francisco met at the Powell BART entrance to mark the 33rd anniversary of the Three Mile Island accident. We read a statement, with Japanese translation, by TMI survivor Libbe HaLevy… Very few of the passerbys had even heard of Three Mile Island but many stayed to listen. 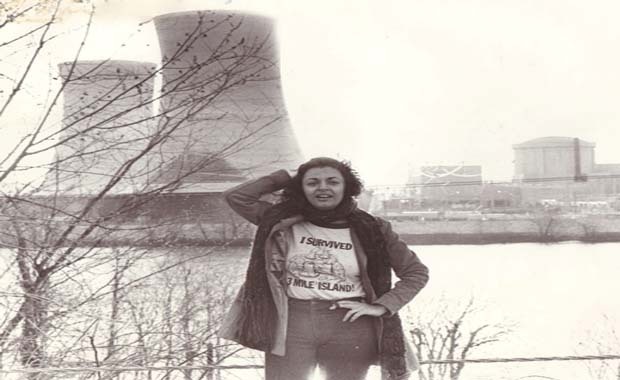 Libbe HaLevy is the producer of Nuclear Hotseat Podcast and is currently writing Yes, I Glow in theDark: From Three Mile Island to Beyond Fukushima, a Very Personal Nuclear Reaction. Videotape of the event is posted below — thank you Azusa for taping. What we forget is the fear. I recently asked a well-known and respected nuclear activist if there were to be any actions taking place this year on March 28 and this person said, ‘What’s March 28?’ In the wake of Fukushima, we often find ourselves mentioning the nuclear accident that took place at Three Mile Island, which happened 33 years ago today, March 28. But we don’t really examine it, consider it in any detail. There are probably individuals among you who were born after March 28, 1979 and don’t know much about this accident other than ‘it happened, nobody died, big deal’ and move the nuclear discussion to the more obvious horrors of Chernobyl or Fukushima. I can’t forget because I was there, up close and personal when it happened, literally one mile away. The first day, I was able to ignore it by not paying attention to the media. The second day of the accident, as the reactors leaked radioactivity into the environment, I walked over a mile into Middletown, stood around outside talking with people, waiting for a bus, breathing deeply of the Pennsylvania springtime air. I ignored the growing hysteria around the accident as “media hype” and let myself be reassured by the officials, because didn’t want to change my plans. The third day, alone in my friends’ house, I heard the same announcement coming down the street as the people of Fukushima heard: “Keep your doors and windows closed. Stay inside and do not go out unless you absolutely have to.” Suddenly, everything I had been made afraid of during the Cold War as coming from the Russians was threatening my life only one mile away — courtesy my own government. There was nowhere to run, nowhere to hide; for all I knew, the radiation level was so high that, in effect, I was already dead. My journey back from that horror took years and included post traumatic stress (before we knew the term), compulsive over-use of alcohol and food, and the decision not to have children rather than risk giving birth to mutants. When pro-nuclear forces state, “Nobody died at Three Mile Island,” they are not taking int account the offspring I never had. What we forget is the fear that raged along the east coast. People jammed the highways fleeing the Middletown/Harrisburg area. People in New York evacuated to New England. Everyone worried if they had gotten far enough away. The media covered the unfolding disaster with little interference; Waltern Cronkite anchored a particularly fine special report. People felt threatened, angered, outraged — all appropriate responses to a nuclear accident. We need to remember the fear because the fear created by Three Mile Island stopped the nuclear industry dead in its tracks, because it moved people from fear to anger and then into action against the nuclear power industry. No new nuclear reactors were licensed from 1979 until 2011, when the decades of pro-nuclear public relations and dis-information campaigns finally took hold. The public has been sold a toxic bill of goods that nuclear is “clean, green and sustainable” when it’s the most deadly form of energy generation ever invented. Consider that fear, because it is exactly what any one of us will be feeling if the sirens go off and announce a new accident has happened at a nuclear reactor. I pray that never happens. The last thing an anti-nuclear activist wants to be able to say is, “I told you so!” But we are, none of us, safe as long as nuclear reactors continue to operate and generate radioactive waste with a half-life of tens of thousands of years.